For a song to cross borders and oceans, cultures and languages, epochs and genres, one might imagine complex melodies and immense lyrics, not a lullaby for a troubled world. An internationally recognized masterpiece would certainly be the work of profound composers, not a humble assistant priest and school teacher who played guitar. And yet, this is the origin of one the world’s most cherished carols, “Silent Night,” celebrating its 200thanniversary on Christmas Eve, 2018. Reminiscent of our own troubled times today, “Silent Night” was written in 1816 as a poem by Joseph Mohr under Austria’s oppressive rule, limited freedom of expression, and despair. Two years later, Mohr asked Franz Gruber to set his words to music as an expression of solace, hope, and peace to be performed in Oberndorf near Salzburg, Austria. It’s the holiday hymn which brought a “day of peace” to the Western Front of WWI on Christmas 1914. It reminded soldiers of home and inspired the liberation of Austria from the Nazis during WWII. Bing Crosby’s iconic recording of the song, released in 1935, is the 3rd best-selling recording of all time. Recognized and listed by UNESCO as a work of Intangible Cultural Heritage in 2011, “Silent Night” has become a gentle anthem for world peace. Now, and for our future. 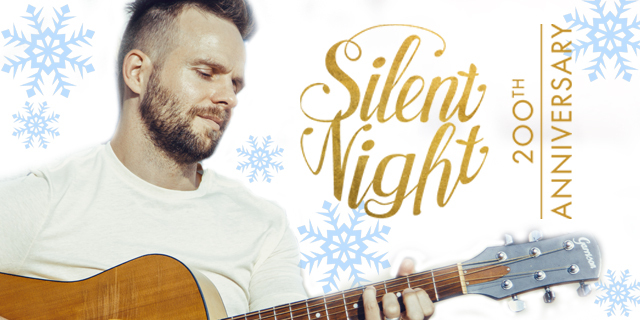 As part of the worldwide ‘Silent Night 200’ celebration, acclaimed out singer/songwriter Tom Goss and indie artist Liz DeRoche, have recorded their own rendition of the song to share with the LGBTQ community. Tom and Liz bring their considerable musical powers to bear on the quintessential Christmas song in classic ‘Goss’ style. Never veering from thoughtful, pensive attention to the lyrics, the two artists blend their voices in quiet homage that is sensitive, yet simultaneously brimming with emotion. Ethereal and light, Tom and Liz find the heart of a delicate melody that is literally celebrated around the world without resorting to heavy-handed production or studio trickery. The musical duo echo here the same peaceful sentiment born 200 years ago in Austria. Speaking of 'around the world,' you can be a part of a global sing-a-long of “Silent Night” by clicking over to www.stillenacht.com on the 24thof December (5.00 p.m. MEZ; 4.00 p.m. UTC; 11.00 a.m US EST - east coast; 8.00 a.m. US PST - west coast). Thanks to my friend and fellow blogger Larry at the LGBTQ blog, theOUTfront.com, for collaborating on this post.